Donations were made to temples, mutts, religious persons and the same was recorded in Palm leaves, copper plates and stone epigraphs by which the records were called as “Tribalī-śāsanam”. 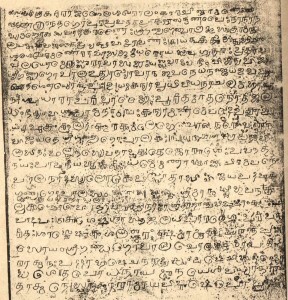 Such copper plate inscriptions are available at Kāmakoṭi pīṭham which claims its lineage from Śrīmad Ādi Śaṅkara Bhagavatpāda at Kāñcīpuram. Actually the mutt possessed more than 120 copper plates including that of Coḹas etc. Sri. Babu Rao , Mahraṭṭa translator for Col Mackenzie makes the claim in Mackenzie Collection, Vol II, published in 1828 CE. But due to unawareness most of the plates are lost and when Sri. T.A.Gopinatha Rao tried to edit the copper plate inscriptions of the Mutt, he could find only 10 copper plates. The officials of the mutt kept only those connected with land endowments, in the villages, which were then under actual enjoyment of the Mitt. Some aged scholar of the Mutt informed that copper plates containing inscriptions were melted ad converted into Pañcapatrams and other vessels in about the last quarter of 19th CE. The earliest amongst the inscriptions that are found is the inscription of Vijaya Gaṇḍa Gopāla Deva of Telugu Coḹa race. The inscription contains two plates with 8.7 inches length at the sides and 10.9 inches at the middle. The inscription is in Sanskrit and inscribed with Grantha letters of 13th CE. The copper plate inscription confers in perpetuity the village of Ambikāpuram, near Kāñcīpuram on the preceptor, Śrī śaṅkarārya of the maṭha, for feeding one hundred and eight Brahmins every day. The village Ambikāpuram is a village on the northern bank of Vegavatī and is now known as Ambi. In this village Kāmakoṭi maṭha still possess some landed property. Gṛdhrapura one of the boundaries of Ambikāpuram mentioned is the modern Tiruppuṭkuḷi. Other boundaries mentioned are Kāñcīpuram, Kaidaḍuppūru and Ciṙinaṉṉi. The last named village is now known as Ceraṇai. When Sri. T.A.Gopinatha Rao edited the inscription during 1916, he couldn’t find the first plate of the inscription. So only based on the astronomical data found in the inscription he assigned the date as 9th July 1291 CE. The data from the record says that the grant was made on the cyclic year Khara, Karkaṭaka Māsa, śuklapakṣa Daśami, Anurādha Nakṣatra and Monday. Accordingly he made the claim. Prof. S. Venkateswara, who published again the plate in Epigraphia Indica Vol XIII, he identified the king as Vijayagaṇḍa Gopāla deva of Telugu-Pallava dynasty who ascended the throne during 1250 CE. But he questioned the date that was fixed by Sri.Rao since the astronomical details were not tallying. He even considered 1351 CE which is again a cyclic year Khara. Then he analyzed the Gaṇḍa Gopāla kings of Telugu-Coḹa dynasty and left without any conclusion. Years later, the first part of the copper plate was found in the Mutt. The first part clearly mentions that the king belongs to the Coḹa race (Coḹa-nareśvara) and the grant is made in his 16th regnal year. Hence the option of Vijayagaṇḍa Gopāla Deva was ruled out by Sri. N.Ramesan, former director of Andhra Pradesh State archeology, who edited the first plate. He made the table of Khara cyclic year with Karkaṭaka māsa and other details. Then he took the date July 17th, 1111 CE since all the astronomical details are matching. I wonder this claim which cannot be supported by the paleography and political situation of the period. During this period, Kāñcīpuram was like the second capital for Coḹas of Vijayālaya line. Here the king refers his own regnal year and not any super-ruler, which clearly states that the king was the independent ruler of the Kāñcī region. Hence though a fool, I cannot digest this earlier date and want to revise the date. According to Sri. K.A.N.Sastri, (The Colas, pp 389-90), Kāñcī, from the hands of Kulottuṅga III (1178 – 1218 CE) was lost to Telugu Coḹas between 1204 to 1213 CE. The Telugu Coḍa chief Tirukkāḷatti Deva alias Gaṇḍa Gopāla Deva who is identified by some scholars as Coḹa Tikka refers his 15th regnal year as 1230-31 and announces himself as an independent ruler of Kāñcī. His grants for the Varadarāja temple, Kāñcīpuam, are recorded till his 22nd regnal year (1238 CE) (Nos 415 and 434 of ARE 1919). Hence his 16th year is 1231 CE which is a Khara cyclic year. 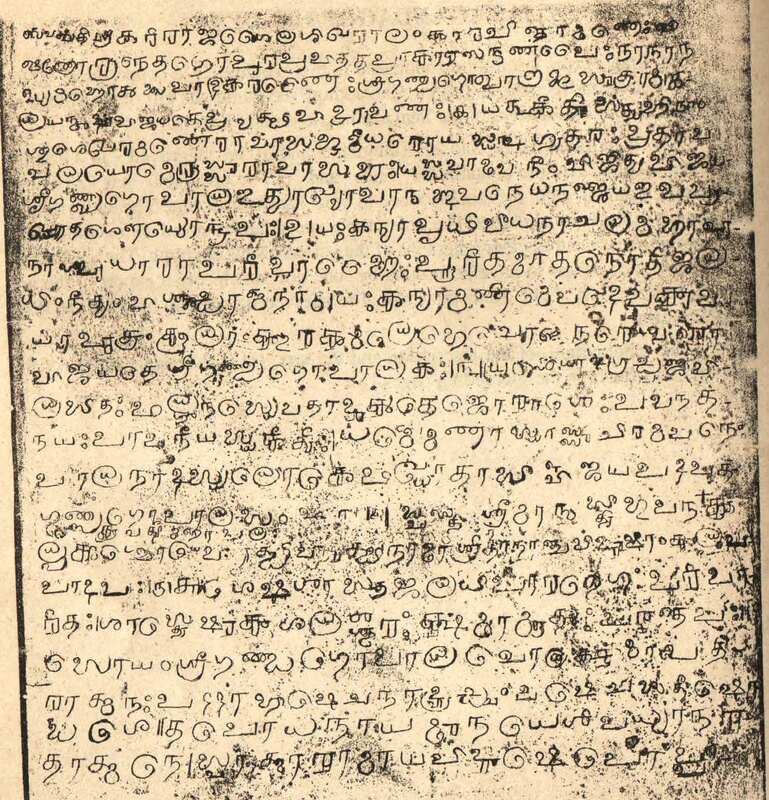 The first verse of this plate clearly mentions that the king made grants for Varadarāja Temple. Hence I hereby make a claim that the king mentioned in this charter is Tikka I alias Gaṇḍa Gopāla or Tirukkāḷatti Deva and revise the date as July 13th, 1231 CE. The one and only problem with this date is the day which is Thursday and not Monday. But this error is very common in many of the inscription and can be ignored. Śri Gaṇḍa Gopāla, the destroyer of enemies, Indra on the earth, is victorious with pleasure, by building tall Gopuras, extended compounds and pavilions for Viṣṇu who is the crest jewel of the Hastigiri and made grants for new festivals. The king, Śrī Gaṇḍa Gopāla, who got the surname “Vijaya” by winning the whole world, a well known person of valor and equal to Arjuna, whose fame is the mountain Kailāsa, seat of Lord Śiva, whose crest jewel is moon, whose circle of valour is the highest Meru mountain the abode of gods. Śri Gaṇḍa Gopāla, the Coḹa king is victorious, who filled the ocean by the waters that are sprinkled during the donation of the daughter like earth to pure persons and who got a female child as his successor. His highest flag was decorated by Hanumān, son of the air-god like that of Arjuna and whose fame is very pure. Since he protected the world with Dharma he got the name Gaṇḍa gopala and Vijaya. Hail. The wealthy emperor of three world and of great strength. The Coḹa king is the Kalpaka tree for the scholars and those take shelter on him and those who request him. He was surrounded by the persons who crossed the ocean of all scriptures. He was expert in scriptures and valorous. He was a holy person and an embodiment of the earth. Śrī Gaṇḍa Gopāla, The king, in his sixteenth year after his coronation …. To the preceptor, Śaṅkarācārya, who is very ascetic, a sage and indulged in meditating Lord Śiva, a great scholar, seer of inner bliss, well known with the name “Boppili”, who explain the secret meaning of Vedānta to his disciples at the mutt at the western direction of Śri Hastiśaila Nātha (Varada Rāja), who pleased the Brahmins by feeding them daily. In the cyclic year named Khara…. When the Sun god entered in the holy Karkaṭaka Rāśi and in the Nakṣatra of which the presiding deity is Mitra (Anurādhā) and in śukla pakṣa. In the east of Gṛdhrapura, and in the west of Kāñcīpuram, in the north of Kaidaḍuppūr and in the south of śirunanni. Situated on the northern bank of Vegavatī and decorated with gardens. Fragranced with the flowers of so many trees and decorated with Coconut, Mango, jack, Palmyra and Hintāla. He gave Ambikāpura, the crest jewel of villages in the Eyirkoṣṭha (Eyil koṭṭam) and was protected by the grace of Lord śiva. By the gift of this land, for as long as Sun and the Moon run on their course may the Supreme God whose abode is śrī Hasti śaila, be pleased. Thus, with towering devotion resting his mind in God, the glorious chief Gaṇḍa Gopāla Coḹa gave the charter a gift of land written in his own hand to śaṅkara Yogi with a pure mind aspiring for the highest good. Of gift, and its maintenance, maintenance is more meritorious than gift. By gift heaven is attained, by maintenance the place of Acyuta. The glorious Vijaya Gaṇḍa Gopāla Deva. It may be noted that the mutt referred here to the west of Varadarāja temple might be a branch mutt of the present one or the original place of the mutt. This grant is supported by another stone epigraph from the village Ambi. The inscription is found on the northern wall of Ambikāpatīśvara temple of the village. The inscription is dated as 1514 CE since it refers the śaka year 1436. The inscription belongs to the reign of Kṛṣṇa Devarāya. ஸ்வஸ்திஸ்ரீமன் மஹாமண்டலேஶ்வர ஸ்ரீவீரப்ரதாப க்ருஷ்ணதேவமஹாராயர் ப்ருத்வீராஜ்யம் பண்ணி அருளாநின்ற சகம் 1436க்கு மேல் செல்லா நின்ற பவஸம்வத்ஸரத்து ஆடிமாதம் 13-ஆம் தேதி நம்முடைய மடப்புறம் தூளி அம்பி அம்பிகாவனமுடைய தம்பிரானார் பூசைத்திருப்பணி மார்கழித்திருநாளுக்கு க்ருஷ்ணராயர் தர்ம்மமாக சந்த்ராதித்யர் வரையும் இந்த தர்மம் தூளி நடத்தக்கடவதாகவும் இவை சந்திர சேகர ஸரஸ்வதி எழுத்து. “When Mahāmaṇḍaleśvara Vīrapratāpa Kṛṣṇadevarāya was ruling the earth, in the śaka year 1436, corresponding to yhe cyclic year Bhava, on the 13th day of the month āḍi, a special worship in honour of Kṛṣṇa Devarāya, should be performed to the God of Ambikāvanam in our Maḍappuṙam ambi, in the month of Mārgaḹi, This worship should be conducted as long as the Moon and Sun exist. Candraśekhara Sarasvatī (signature). The signatory Svāmiji is identified as Śrī Candraśekharendra Sarasvatī, the 55th ācārya of the mutt according to the Mutt’s Guru Paramparā. Here the word “Nam Maḍappuṙam ambi” – Ambi, donated land to our mutt is the phrase which confirms the above grant. Adhiṣṭhānas of some ācāryas are also there in the village. The another point is the signatory of this stone epigraph is the donee in the Copper plate inscription of Kṛṣṇa Devarāya. 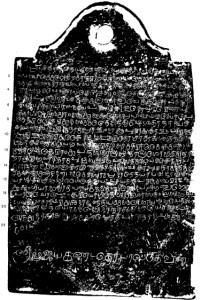 Hereby I make a claim that this can be considered to be the earliest copper plate inscription of the mutts that are attributed to Ādi śaṅkara Bhagavatpāda. 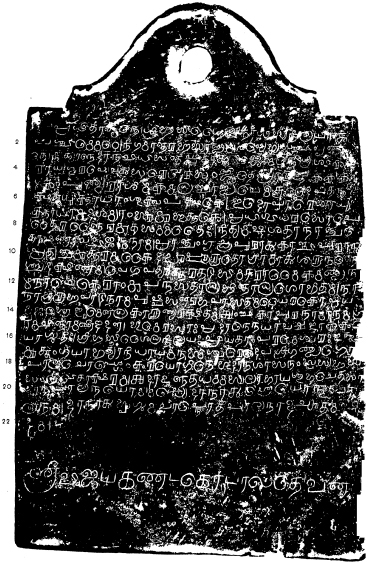 Epigraphy Chola, copper plate, Kamakoti, Kanchipuram, Kil Ambi, Krishnadevaraya, Peetha, Sankaracharya, Telugu, Vijaya Ganda Gopala Deva. permalink.